For free modelling in styrofoam, for free cutting in thick styrofoam panels, or for the manufacture of any profile. Excellent for architectural model building, prototype construction, and classical model building without crumbling as when working with a knife and sandpaper. Stable frame with pivoted fixing element and extendable lower wire fixing. This means a maximum extension of 200mm. Workpiece height 150mm. Cutting wire temperature infinitely variable. With a little practice, you can achieve optimum cuts depending on the material density and thickness. This is mostly possible at medium temperatures and without too much pressure. Heats up in one second! Complete with five deformable cutting wires 200 x 0.85mm, additional wires available. 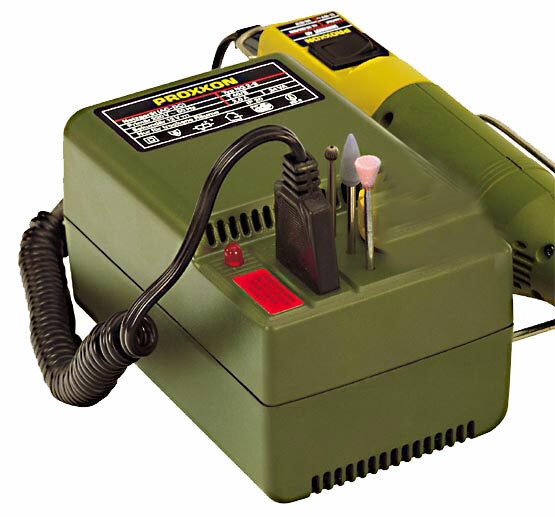 Requires a MICROMOT style 12-18V power supply up to 2A. 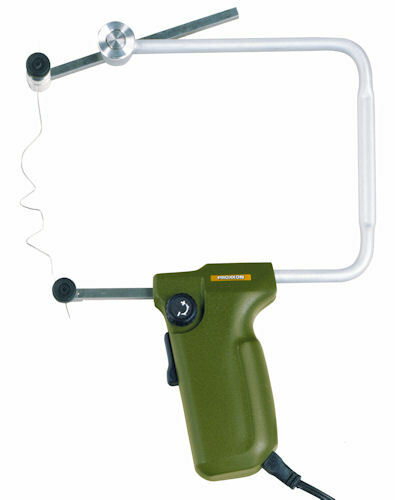 Click the button below to add the Hot wire foam cutter THERMOCUT 12/E (12V DC) to your wish list.